The Graduate Student Association claimed first place in both the alumni and women’s Beer Bike races, while McMurtry College took first in the men’s Beer Run, according to official results posted by the Rice Program Council. However, the results of the men’s and women’s races came into question as Jones challenged penalties against the pit crew during the women’s race and RPC’s reported split times indicated that a McMurtry men’s runner ran his one-third mile split in just over 20 seconds. Beer Bike is arguably the most important social event on the Rice calendar. Students call it the best day of the year or even Christmas. From the early wake-up to the Martel sundeck to the water balloon fight to the races, it is a day of celebration and a journey outside of the normal obligations of being a college student. Although the residential college system is one of the most prominent aspects of life at Rice, the process of sorting students into colleges remains shrouded in mystery. Is it a computer program? A sorting hat? Fate? This year, Hanszen College’s room draw ended with 17 unclaimed beds. 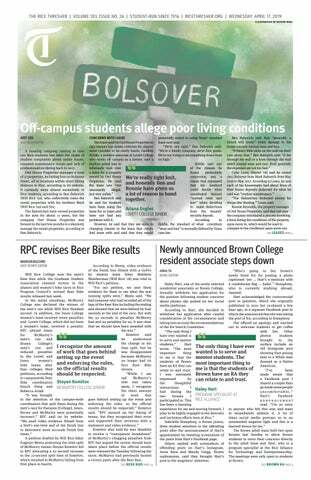 It’s been well-established that Hanszen’s housing facilities are in dire need of upgrades, but so far Rice’s administration has largely turned a blind eye to the housing discrepancies that threaten to sully the perceived equality of the residential college system. This should be the last straw. Rice needs to make a concrete, meaningful and tangible pledge to construct a new residential building for Hanszen. Since the announcement of Mike Pence’s visit, many students have expressed valid concerns about the vice president’s extremely misguided and hurtful views and policies on LGBTQ rights and other issues. I share these concerns and believe that we should be doing everything possible to call out and refuse bigotry and hate, especially on issues that directly threaten members of our Rice, Houston and other communities. Slurping noises introduce pop artist Billie Eilish’s new and first album, “WHEN WE ALL FALL ASLEEP, WHERE DO WE GO?” Giggles are accompanied by Eilish stating “I have taken out my Invisalign, and … this is the album.” Weird ASMR or Eilish having fun — the 14 second introduction sets the tone for the rest of Eilish’s album. Brooding and weird at times, the 14-track album carries an underlying taunting tone that shows Eilish is here to have fun. After rising to fame with her Netflix stand-up specials Baby Cobra (2016) and Hard-Knock Wife (2018), writer and comedian Ali Wong took Houston on in her sold out 2019 Milk & Money Tour. The crowd was filled with a number of pregnant women, many of them dressed up in Wong’s iconic Baby Cobra outfit—red-rimmed glasses and cheetah-print dress. This show held many firsts for me—I’d never had my phone locked away for a show before, and I’d never seen Wong, well, not pregnant. Across the Sewall courtyard, “Inside,” a piece by architecture student Belle Carroll, appears deeply surreal, interrupting the brick and metal grating of the exterior wall with an emanation of pink light. Stepping past the threshold of the Inferno Gallery and through a gaping opening that runs almost ceiling to floor places the viewer in a softly lit, organically shaped chamber of gauze. A speaker continuously plays poems and selections from “Bridges,” a musical composition by Carroll herself. Earlier this month, Rice students had a chance to put down their books for a week and take a much needed break. Here’s a look at what some owls did. Rice Women’s soccer has hired former Louisiana State University head soccer coach Brian Lee for the same position, according to a release from Rice Athletics. Last season, Lee led the Tigers to the Southeastern Conference Tournament title and the second round of the NCAA Tournament. Rice Graduate Student Association President Jason Guo recently led a multi-university graduate student coalition in penning a letter in support of the rights of international graduate students to study in the United States. Martel College — The Emperor’s New Booze: Pull the Handle, Kronk! A volcano that erupts wine and Fireball and a massive bottle of Smirnoff are two phallic floats that will grace the parade from the water balloon fight to the Beer Bike track. Gigi Rill had no time to pause for an interview as she worked on the Martel Beer Bike build the Sunday before Willy Week.